In recognition of its commitment to getting the best out of high-achieving pupils, the school has achieved the National Association for Able Children in Education (NACE) Cymru Challenge Award. Representatives from NACE spent time at the school observing lessons and interviewing pupils, teachers, parents and governors. They were particularly impressed by the school’s strong leadership and the importance placed on the needs of more able learners. 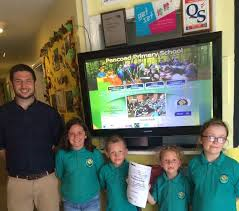 Pencoed Primary has become the 47th school in Wales and the 372nd school overall to achieve the accreditation from NACE.